In terms of demographic development, Azerbaijan has become a leading country among not only the former Soviet Union but also most of the European countries by the birth of its 10 millionth citizen on April 6, this year. President Ilham Aliyev and first lady Mehriban Aliyeva congratulated the people of Azerbaijan and the parents of the newborn on this occasion and gave the child their blessings. 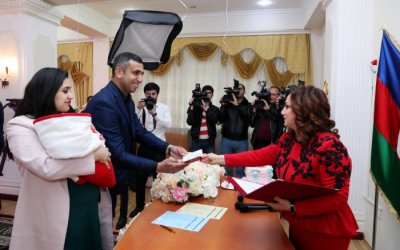 On April 10, the parents of the newborn girl arrived at Narimanov district registration office and noted that they named their baby in honor of the first lady Mehriban Aliyeva. They thanked President Ilham Aliyev and his wife for the attention to them. Chief of the registration office Saadat Ismayilova solemnly presented the birth certificate to the parents of the 10 millionth citizen of Azerbaijan Mehriban Hasanova. The parents of the newborn were also presented with keepsakes.